MAN Bus subsidiary Neoplan has launched the Tourliner as a new entry model in the premium coach sector. The new exterior design gives increased aerodynamics by more than 20% in comparison to the previous model. The drag coefficient is only Cd = 0.36, which is equivalent to that of a modern mid-size van. This is achieved in part by the new exterior mirrors, which feature improved wind resistance and provide a better view. In addition, the D26 engine now comes with increased performance and torque, featuring an optimised driveline that allows for fuel savings of up to 10%. This is due to the long final drive ratio of i = 2.73 and the optimised shifting strategy among other things. 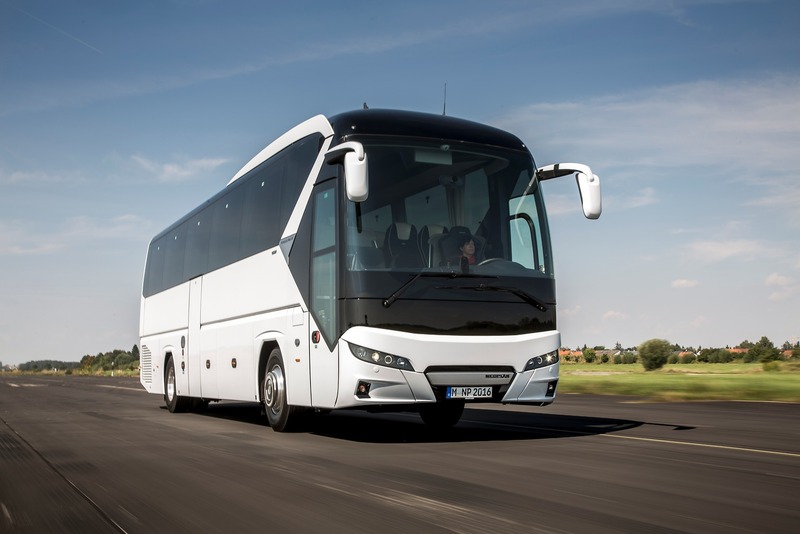 The new generation of MAN EfficientCruise has also been added to the line-up now, meaning that the MAN EfficientRoll free-wheel feature is available for coaches for the very first time. This ‘sailing’ mode provides a gain in efficiency even on slight downward gradients by automatically shifting the gearbox to the neutral ‘N’ position and allowing the bus to move with as little engine friction loss as possible. Another innovation in this area is the latest generation of pre-emptive cruise control systems, MAN EfficientCruise® GPS-assisted cruise control system detects up and downward gradients along the route up to three kilometres in advance. This means that it can adjust the selected gear and speed to achieve optimum economy whilst driving. Downshifts are suppressed where appropriate. The driver simply selects the desired speed and one of the four possible speed tolerance levels (ECO Level I - IIII). Level I denotes the smallest deviation from the set speed, Level IIII the greatest. The latter allows maximum fuel savings and is ideal for light traffic on motorways and country roads. By means of a rocker switch, the ECO level may be adjusted to the current traffic situation at any time during the journey. Thanks to innovative technology, coasting is now introduced which is intelligently controlled by means of GPS preview. MAN has significantly expanded the potential for fuel savings. Even when on a slight downward gradient, the transmission automatically shifts to the neutral position "N" - but only where fuel consumption can actually be reduced. Thus the momentum is maintained and the vehicle loses speed less quickly than with an engaged gear. EfficientRoll combined with MAN EfficientCruise® saves more fuel and allows the vehicle to travel in a more environmentally friendly manner than previously. The smooth intervention of the cruise control enormously increases comfort and optimally reduces the strain on the driver. This means that the driver can now concentrate fully on the driving tasks whilst letting the new systems take control of smooth driving.